USA swimmer Phoebe Bacon in action at the Damodar Aquatic Centre in Suva on August 21, 2018. Photo: Swim Swam. The first day of the 2018 Junior Pan Pacific Swimming Champion­ships at the Damodar Aquat­ic Centre in Suva was almost like an American intrasquad meet. The United States had every top seed in last night finals and every second seed except one. This could be a record set­ting medal haul for the Amer­icans. According to Swim Swam, earlier on a meet record had already fallen to the likes of team captain Phoebe Bacon in the 100 metres backstroke. 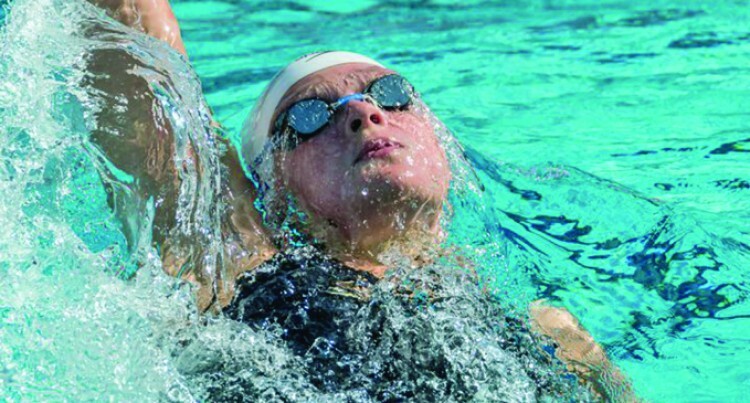 She became the first swim­mer at the meet to break a minute in the event lowering the old record set by Austral­ia’s Minna Atherton in 2016. Gianluca Urlando also had a big morning with his 200m butterfly. Drew Kibler, Destin Lasco, Claire Tuggle and Ol­ivia Carter were the other top seeds for the finals which was still going when this edition went to press last night. The Americans have the top two seeds for the 200m freestyle final with 14-year-old Claire Tuggle (1:59.36) and 18-year-old Isabel Ivey (1:59.69) breaking two min­utes in the heats to start off the Junior Pan Pacific Swim­ming Championships. The third swimmer to break two minutes was Australian Lani Pallister (1:59.75) who will be the third seed for the finals. Tuggle is still chasing the NAG record for the 13-14 age group at 1:58.53 from Sippy Woodhead back in 1978. Tug­gle’s best time is a 1:58.59 from the nationals. Ivey’s best time is a 1:58.94 from the Junior Pan Pacs in 2016. The rules for Junior Pan Pacs are the same as they are in the senior meet as the top two swimmers from each country will represent them in the final. Each country can enter as many swimmers as they want but only two are allowed to swim in the A-Final. They are Japan’s Nagisa Ikemoto (2:00.32), Australia’s Eliza King (2:00.98), New Zealand’s Erika Fairweather (2:02.11), Canada’s Ainsley McMurray (2:02.97) and Ja­pan’s Miyu Namba (2:03.01) also qualified for the A-Final.